Hello, I also have a question. I have many hundreds (!) of seedlings, ranging from 2" to a foot and a half high in my backyard. I'd like to put them in pots, but what kind of potting soil should I be using, and what should I be looking out for in the long term. I will be growing these to eventually give as gifts, and then probably selling the rest of them. Any advice will be greatly appreciated! Thank you! What size peat pots are you talking about? I have seedlings that are 7 months old that are in 2 gallon pots and a couple are pushing there first true leaf. I would like to know the soil and fertilizer you are using. Mine are about 7 inches high in 3-4 inch peat pots. Most have two leaves. Plants from seeds seem to do better than transplanting that seems to shock them requiring some time for new vertical growth. I do think one problem you have with using peat pots is they are not very deep and that is going to slow you down some, I have found experimenting with different size pots the deeper the pot the faster growth I have gotten, the best I have found have been 3.75"x3.75"x9.5"and also use 3.5"x3.5"x5". I do not germinate in these, I germinate in 1.5" deep 8" clear plastic pot saucers in side a 1 gallon zip loc bag. Holds at least 100 of most seeds, large seeds I germinate in 24 oz styrofoam cups, for both I use a 50/50 mix of perilite and vermiculite. I mix my own media, 5 parts peat, 2 parts perilite, 1 part sand or vermiculite, 1 tbs per gallon of soil of 10-10-10 fertilizer, 1 tbs per gallon of soil pellitized limestone, 1 tsp per gallon of soil magnesium sulfate. 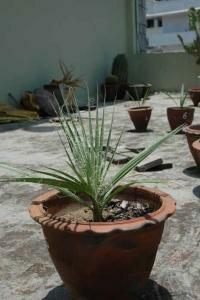 Ater 2 months in a pot I use Nutri-Pak Palm fertilizer 1 year pak 1 for every 2 gallons of pot. There are two species of Washingtonia, which one are you talking about ? W.robusta or W.filifera ? Thanks for the GREAT suggestions. Rason I like peat pots is that it is easy to move them to the next size pot...just remove the bottom and plant the whole remaining peat pot in the next size pot. I will pot another hundred and do some experiments with soil and fertilizer. Are not growth rates, and soil/fertilizer requirments for both Washingtonia (robusta and filifera) the same? a young sapling.now this is around 7 months old. These guys grow like weeds out here in SoCal and we have to pull them up every month. They are slow at first but will grow rapidly after the first 6 months. These guys love the sun. The robusta has better frond but the filifera has the better trunk. The trunk of the filifera can be 4 times that of the robusta. I'm not impress with the Washies, however, if you get a chance to go to the Buffalo Bills Casino on the Cali-Nevada border, the trunks on the filifera are quite impressive. In my opinion, the filifera is the better palm and might worth the try if I have about 10 acres of land(hehe.. 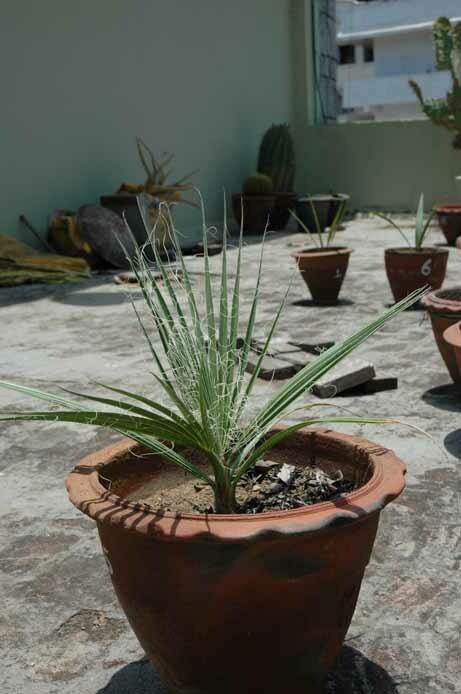 I might plant a few after I have almost all of the palms in the world).